Every ministry kid needs a friend! Did you ever have a pen pal? I had lots through the years when I was a kid and teenager. I even have a pen pal I have written for the past 3 years and I still love it. I would encourage you to help your child find a child who is also in ministry or another Christian kid of like faith and practice. Ministry kids need to know there are other ministry children who are doing similar things they do in their family and in their church. I believe the common factor of similar beliefs alone will help establish a good friendship (but Ministry Mamas, we may have to help the kids be faithful to writing… more on that below!) Missionary children can also benefit from pen pals because it helps them be able to express themselves about their life and experiences on the mission field. The truth of it is, they wouldn’t have to write a child but maybe a trusted Christian you know. A godly person with wisdom who would encourage and cultivate a good relationship with them that points them to Christ. Other people to keep in touch with might be: A Christian soldier who is deployed, a Bible College student, a youth pastor and/or his wife, a young adult on the mission field, or any other godly influence with time enough to sit and write. Writing to people keeps children connected to a broader world. There are lots of ministry kids who are lonely because they go to a church with very few children their age or missionary kids are in a foreign country surrounded by a different culture. Having a pen pal can connect a ministry kid with another child who lives like they do, serving God with their family. Another lesson under this umbrella is that writing a person who is different lets your child understand variations in personalities and family preferences are common and that’s a good thing! When our children learn people can be different and still love and serve God the way they do then it helps them understand we do not have to be exactly alike to enjoy the company of one another. It teaches children about the joy of giving and receiving. To keep a pen pal relationship going there has to be reciprocation between letters — I send one, I receive one, etc. (This principle applies in so many aspects of life.) Receiving real mail is exciting! Letters have a mysterious element to them because you do not know its contents until you read it. Ministry kids who may be seeing or experiencing trials or personal struggles can benefit from the blessing of the letters from a friend and giving back. It can also help them look outside themselves by asking about the other person and being interested in their life. Having a pen pal teaches how to converse and encourage others. Reading letters can help your child learn to read tone and understand the feelings and heart of the other person. This practice of learning about the heart of another person can generate the qualities of empathy, compassion, and kindness. Children may open up to each other about their experiences and it can allow them to be able to have an opportunity to be a prayer partner with their pen pal and encourage them in life’s joys and struggles. Create a basket or kit that will have the necessary supplies they need to be able to write to their pen pal. Paper, pens, envelopes, and stamps are the very basics — add in stickers, gel pens, and stamps for more fun. There are great ideas for pen pal kits to send to your pen pal all over Pinterest, check this one out. It does not have to cost a lot of moolah, dollar stores have cheap supplies and cards. You can also teach your children to invest in buying the supplies for writing with money they earn. Help them with their writing skills. Teach them to write a letter and then teach them how to read a letter and respond with care. Teach them that writing a good letter can contain stories, descriptions, and questions. Writing without “I” as the main subject can be a challenge and should be attempted. Note: Boys may only have a factual type of letter exchange while girls may tend to share anything and everything going on in their lives and that’s okay! Help them spark their creativity with ideas and examples if they need it. Remind them to write when they receive a letter. There’s nothing worse than being a pen pal waiting desperately for a letter to arrive only to find out that you have been forgotten. It would be better for your child to write to their pen pal explaining why they will not be writing than no explanation at all. Before committing to a pen pal relationship consider the amount of time your child has. If they will be too busy to write it may be best to postpone having a pen pal until a better time. Be knowledgeable of the content of the letters if you can. Help them navigate even a pen pal relationship if they need help. Your job is to protect and nurture a good relationship. If the relationship goes south because of inappropriate content or the two pen pals are not a good match, then be willing to let that pen pal go. Be there for your child when and if those disappointments come. It is understandable people do change over time and so do their interests and not all pen pals are a good fit with each other. Spark their creativity! Help them keep the pen pal relationship interesting by being promoting thoughtfulness. Encourage your child to praying for their friend, include drawings, poems, whatever creative medium your child is good at doing. Or teach them to stretch themselves on the behalf of someone else just to be a blessing. You know your child best and can help them use their talents and gifts to be a blessing to their pal. Hand writing letters is not for everybody so maybe pen pals won’t be for your kid– but what about Skype pals? or e-mail buds? Or phone calls? Or writing cards to missionary or church planter’s kids for their birthdays? 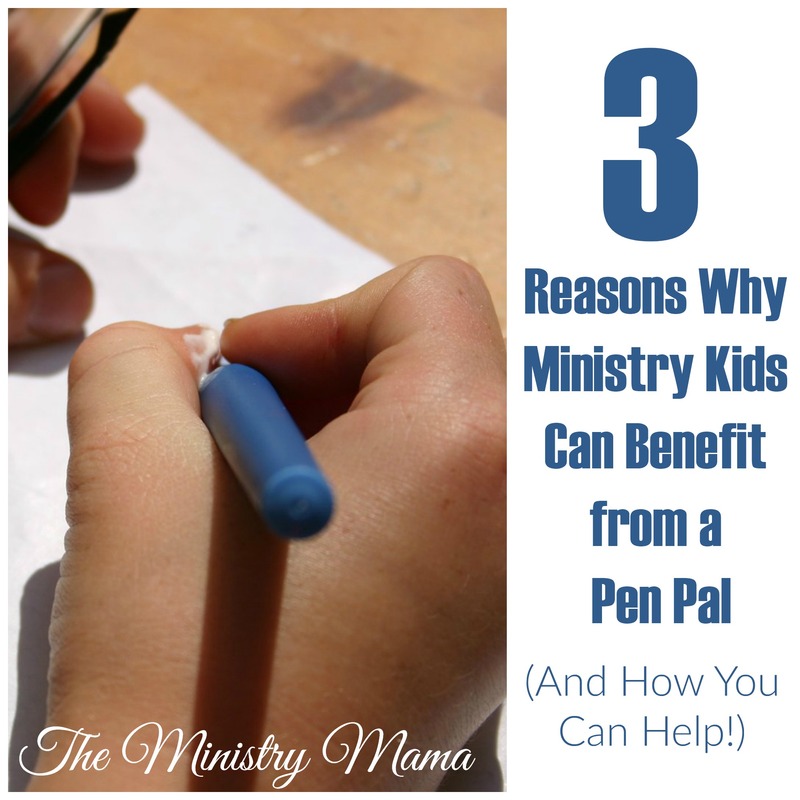 There are other ways to “pen pal” and have our kids connect to kids in ministry (and others!) who may not be local. Encouraging godly relationships is always good for us because we never know how God will use those things in our lives later on down the road! Just recently my husband was reunited with an old acquaintance he attended church camp with in junior high, and it seems they will be working on some upcoming projects together. God’s paths often intertwine in the most unusual ways. Stay tuned for an upcoming article about how I’m involving our oldest boys in pen pals and for a free printable with themes for boys to write about or gifts/exchanges to make with their pen pal!